At a 40 minute period, the game requires an entry of a four-digit code. 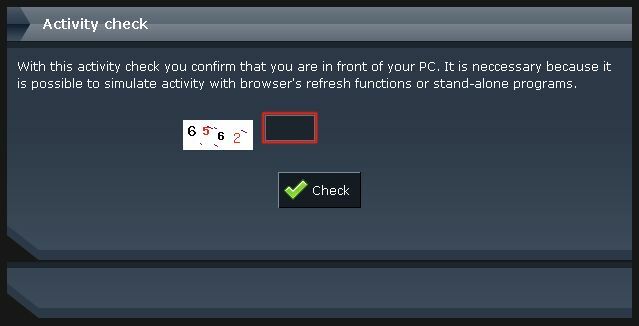 This is an activity check due to the auto refresh features of certain browsers or standalone programs, which may simulate activity in your account. If you have left your browser open and for some reason you find your account waiting for a Botcheck entry, refresh the page – the shown code expires for a short time. If you expect an important action in the game – e.g. battle or harvesting a recycle field with good timing, ensure that the Botcheck will not ruin your plan. At the right top side of your menu you can see the time remains to the next check. Click there and pass the check to reset the timer to 40 minutes.